Site of deserted village, West Ringstead, Dorset. The village of Ringstead (or West Ringstead) is a deserted medieval village in Osmington parish. There are earthworks in a field north of Ringstead Bay which are (just) visible from the SW coast path. These are in a large field which slopes gently up towards Glebe Cottage (which incorporates part of the old church, but which is now mostly hidden in trees) and the chalk escarpment. 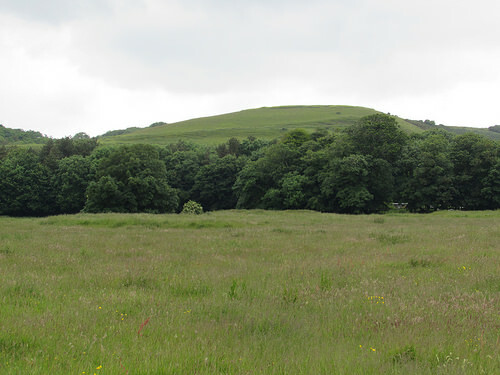 There is a break in the chalk here, and the surrounding hills feature the remains of strip lynchets. Ringstead Old Church, now Glebe Cottage (747817), immediately N. of the site of West Ringstead village (27), has walls of local rubble and a roof covered with modern tiles. Only the chancel and chancel arch survive from the original building which has been considerably altered by the insertion of domestic door and window openings. A church, probably on this site, is first referred to in 1227 [...] and the surviving fabric appears to be of the 13th century; it was largely destroyed or abandoned, with the village, in late mediaeval times. Architectural Description--The Chancel (19½ ft. by 12 1/3 ft.) has a wide plinth, and the line of the original E. gable is visible below the present roof-line. There was no E. window and no traces of original openings remain in the N. and S. walls. At the W. end of the S. wall a break in the masonry in line with the W. side of the W. wall of the chancel marks the end of the original work. The two-centred chancel arch is of two chamfered orders; it is largely blocked but survives to its full height. Nothing remains of the original nave. The presence of a Burial Ground S. of the church has been indicated by numerous finds of bones in the cottage garden. The following fragments of mediaeval dressed stone have also been found: (1) a piece of window tracery with double hollow chamfer on one side; (2) moulded base or capital, much damaged; (3) two pieces of cross-finials; (4) part of a cresset with traces of three sinkings; (5) circular stone basin, damaged, possibly a stoup. Pottery from the garden includes one sherd probably of the 13th century, some fragments of the 16th and 17th centuries and much 18th-century ware. Post-mediaeval alterations--A floor has been inserted in the chancel, supported by a roughly chamfered ceiling beam. A fireplace at the E. end has a chamfered bressummer and a bread oven at the N. side. The building has been heightened and rooms have been added to W. and N. None of the domestic features appears earlier than the 18th century. John Newman and Nikolaus Pevsner, The buildings of England: Dorset. Harmondsworth: Penguin, 1972, pp. 357. Maintained by Michael Day, Last updated: 25 June 2016.